Nothing is more engaging than a pretty smile and white teeth. If you’re concerned about unusual white areas on your teeth, however, see your dentist to determine the cause, so that together you can find a solution. Plaque and tartar, illness during tooth development, decalcification of tooth enamel and the effects of fluoride are situations that can discolor your teeth. But there are remedies -- some easy, some more involved -- that will help you eliminate white spots on your teeth. Plaque is a sticky film, made up of bacteria and food debris, that continually forms on your teeth. While usually colorless, plaque that accumulates around the gum line can appear white. To clean off plaque, brush your teeth thoroughly at least twice a day, and use dental floss daily to clean between your teeth. For optimum cleaning, change out your toothbrush when the bristles begin to fray. When plaque remains on your teeth, it hardens into tartar. Initially, tartar looks white, but eventually it becomes stained by foods or smoking. While tartar cannot be removed by brushing and flossing, a professional cleaning at your dental office will take care of the problem. In a developing tooth, enamel formation can be interrupted by either genetic or environmental factors. Premature birth and early childhood trauma, illness or certain nutritional deficiencies and medications can cause enamel hypoplasia. In this condition, the enamel is unusually thin. Defects from hypoplasia can range from milky-white or yellow spots on the teeth to areas of brown discoloration, often with pits. If hypoplasia is merely a cosmetic concern, your dentist may suggest a technique called microabrasion, which gently removes a thin layer of enamel. The procedure is usually followed by in-office or dentist-supervised, at-home bleaching. Teeth with more serious forms of hypoplasia may need to be covered by resin -- the material used for white fillings -- or veneers. If children ingest too much fluoride while their permanent teeth are developing beneath the gum line, their tooth enamel may show signs of fluorosis when the new teeth come in. Mild fluorosis appears blotchy, with scattered areas of lacy, white flecks, or chalky spots on the surface of the teeth. In severe cases, large white spots, as well as a rough tooth surface with pits, may be present. Fluorosis can’t be removed, but the color of the tooth can be evened out by bleaching plus microabrasion. If this doesn’t improve the appearance to your satisfaction, veneers may be an option. When home dental care isn't up to par, or when people have trouble cleaning around orthodontic braces, white spots due to decalcification may develop. Decalcification occurs when acids released by bacteria in plaque pull calcium from the tooth enamel. Fluoride use can stop the process and replenish some of the calcium, but the white spots are permanent. Dentists will check these spots regularly since they are more prone to decay. Stringent dental care with fluoride-containing toothpaste and mouth rinse, and possibly in-office fluoride treatments, is the mainstay of treatment. The combination of microabrasion and bleaching is a good option to improve the appearance of teeth with mild decalcification, but in severe cases, your dentist may recommend veneers. 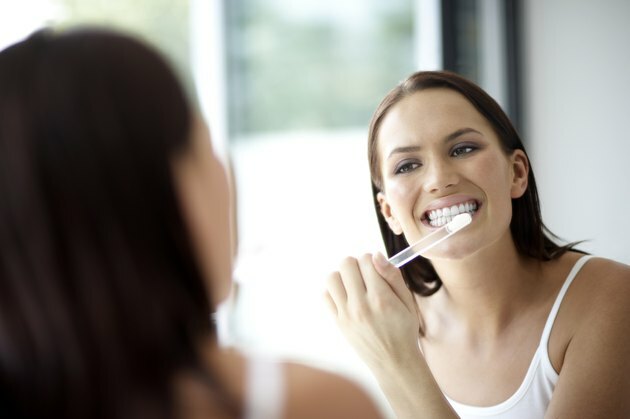 Does Brushing Your Teeth Make Them Whiter?